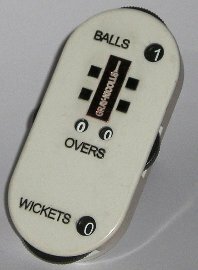 This is the Gray-Nicolls Umpires Counter. Easy to hold, this white counter fits comfortably in your hand. Four dials record the number of balls bowled, the number of overs and wickets fallen. There is an audible 'click' when the dials are turned. Delivered to you in branded Gray-Nicolls packaging this is a very useful item.